Criticism from some environmental groups that the line is likely to help set up Floridians for sticker shock should the supply of natural gas tighten and prices rise. The gas companies certainly have no incentive to keep the price of their product down, and every incentive to push the price up by exporting LNG. 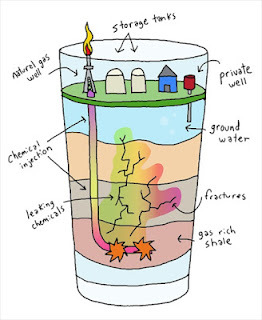 But controversy persists nationally over water pollution caused when drillers use “fracking” to extract natural gas from the ground. Environmentalists also assert that methane — a key ingredient of natural gas and a potent greenhouse gas — leaks from drilling operations and pipelines, adding significantly to global warming. Those concerns and others specific to the pipeline’s potential impacts to private property in Alabama, Georgia and Florida are being raised by a group called SpectraBusters, which is using http://www.spectrabusters.org to organize its efforts. Today, for example, in Osceola County, Florida. Its builder would be Sabal Trail Transmission LLC, a company created by pipeline specialist Spectra Energy Corp. and FPL parent company NextEra Energy Inc. 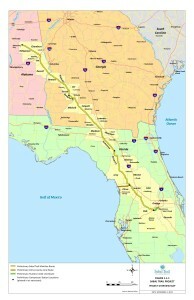 The line’s proposed route in Florida crosses 12 counties and 218 miles. Company officials have said 80 percent of the 36-inch-diameter pipe would follow existing utilities or roads. 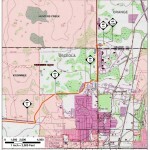 At the end of the Sabal Trail portion would be a 14-mile spur called the Hunters Creek Line that leads to southwest Orange County and connects with the Florida Gas Transmission Co. LLC pipeline, the longest and largest gas-line system in the state. That short segment’s proposed route skirts several neighborhoods. 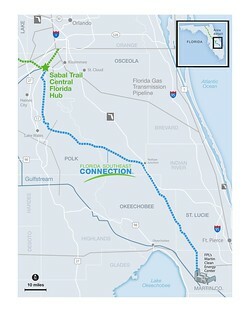 Also connected to the end of the Sabal Trail line would be a 126-mile segment, carrying 400 million cubic feet of gas daily to FPL’s power plants near Lake Okeechobee. Called the Florida Southeast Connection, that project is being pursued by NextEra Energy only and would cross largely rural areas in five counties. 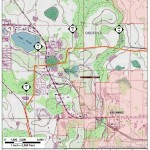 Sabal Trail and Southeast Connection held public meetings late last year. Next to come, possibly later this year, are public meetings by the Federal Energy Regulatory Commission. According to FERC’s John Peconom in Moultrie last month, the scoping meetings could be as early as March 2014. 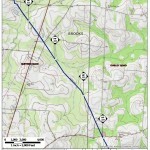 The agency has received dozens of comments already from residents and groups in Georgia and Florida opposed to the project. You can subscribe to those comments on FERC’s e-comment system, and you can submit your own: use docket number PF14-1. Many of those comments are also appearing here on http://www.spectrabusters.org as time permits, including Farmer and lower income folks are people —James & Tracy Ryder to FERC. he would be meeting with S. T.T. LLC in a few weeks and would get back to me. He also stated that this was a Federal issue and that they had no say in the matter. Oh Monica, that’s absurd, but not surprising. I swear… they’ll tell us anything to get us to go away and be quiet. I met with an S.T guy this morning at my neighbor’s house. The guy, who was very pleasant, said that everything was up to FERQ, not Sabal Trail. I responded that I’ve heard that FERQ is more of a pro-pipeline rubber stamp. He vehemently disagreed. He said the ST pipeline is NOT a methane transmission line–it’s a natural gas line that has already separated out the methane. And IF lines explode, the fireball simply goes straight up in the air, not all around, and he shook his head at me when I expressed concern about a possible crater in the fragile underground karst limestone. Would sign my name, but guess that after my meeting this a.m., I should properly sign off as Sabal Trail views me: The Village Idiot…. That’s a typical first respone from a county commission. But now they’ve heard about the pipeline and some more people have. Plus at least one commissioner said there’d be some sort of followup. Marty, try asking Sabal Trail for a list of pipelines FERC has rejected. As for methane, that’s what natural gas is: mostly methane, with various other stuff mixed in. Of course you’re correct–it’s mostly methane with other chemicals and water vapor that can accumulate. When the pipeline temp. heats up, the other chemicals can liquify and clog the pipeline. Is that where compression chambers come in? The S.T. guy said they must periodically send devices called “pigs” with sensors on them down the pipeline to check for corrosion and thinning of the pipeline. Guess FGT’s pig was asleep? From what I’ve researched, anything with a 100-yard diameter is in danger. Spent the day contacting my U.S. Representative (Ted Yoho, not to be confused Yahoo) and U.S. Sen. Bill Nelson. Invited them to our Feb. 20 County Commission meeting. I believe Congress is out, again, on recess next week. Nelson’s Tallahassee person in charge of my county can’t attend our 2/20 mtg. but will be at a pipeline meeting in Wildwood (near Ocala) on Feb. 25. She said that I was only the second call she’s received complaining about the S.Trail pipeline. Also called our FL Insurance Commissioner’s office to see whether, if the pipeline comes on/near my property, I can expect my Homeowner Insurance company to drop me, or increase my premium, due to this extra property damage threat. She said every company makes it’s own decision–and that it is possible that the underwriters could decide that this is more than they care to cover and can drop customers near or on the pipeline route. Here in Florida the insurance companies are positively drooling to drop customers due to hurricanes. So now they have another reason. Monica don’t worry, the Levy Commission looked at me like I had two heads, then I found out later that they would gain 1.6 mil in tax revenue from the building of this pipeline. Soooo, I suppose they will work against the people that voted them in there, force Spectra to stay off county right of ways, and plow through the residents’ farms homes and pastures. Sounds like a plan. I may run for the county commission just to let people know what they are doing. I like the Colquitt County attorney, Lester Castelow, though- he is doing good work for his county in GA. At least they get that it’s an important issue, and are exploring what a county can and cannot do. They are trying. That’s way more than they are doing here. We shall see about Gilchrist County. I think they have a meeting with Spectra on the 20th of Feb.
We do indeed have at meeting Thursday, Feb. 20, here in Gilchrist Co. at 5 p.m. (earlier than ordinary county commission mtgs.) Beth, how/where do I find out how much in tax revenue my county would gain by building this gas line? Heck, in this county, it’s difficult to find out how much co. officials are paid. Not much gubmint in the sunshine ’round here. I’m told I must go to the county courthouse and personally request a salary list (50-mile round trip). Two years ago, this county–with a population of 19,000–was paying a county administrator $100,000 a year! Outrageous. That guy was eventually canned for moonlighting in Levy county for extra bucks. That’s why Fortune 500 companies like Spectra prey on rural counties to site their dirty products. We’re pushovers. I would appreciate spectrabusters.org posting a current update as to where we are with the approval process of this unnecessary and unwanted pipeline from Alabama through many critical areas of Florida. Those of us who live along the route for this insane proposal need to be aware of what we can do to to stop this whole project! In view of the efforts of the State of Georgia to develop renewable sources to provide the power that we need, we need to PRESSURE Rick Scott and the Legislature to do the right thing and get the ball rolling on renewables in Florida as well! Please advise!